For the second straight game, Grambling State overcame a scoreless opening half to win a championship. The first was in the Southwestern Athletic Conference (SWAC) title game against Alcorn State, in which the Grambling Tigers made a furious comeback to win 27-20 in Houston on Dec. 3. 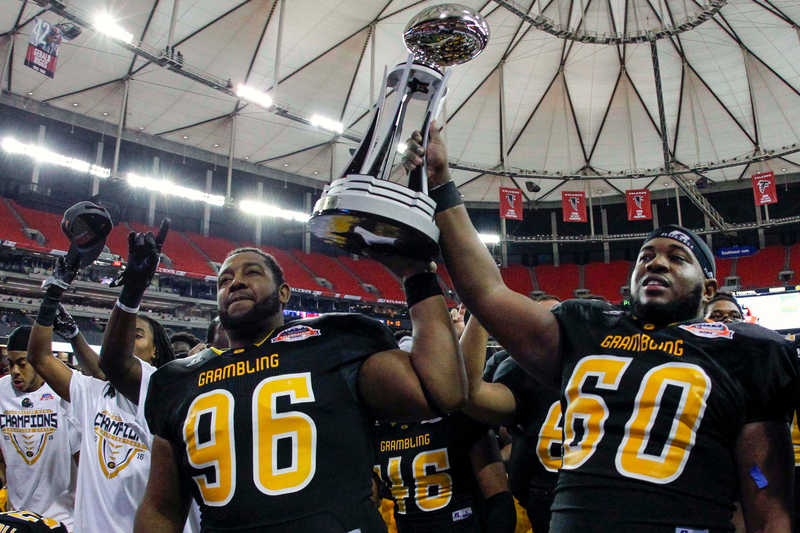 Two weeks later, on Saturday in Atlanta, Grambling came back from a 3-0 deficit against North Carolina Central to win the Air Force Reserve Celebration Bowl, 10-9, at the Georgia Dome for its 14th national championship. 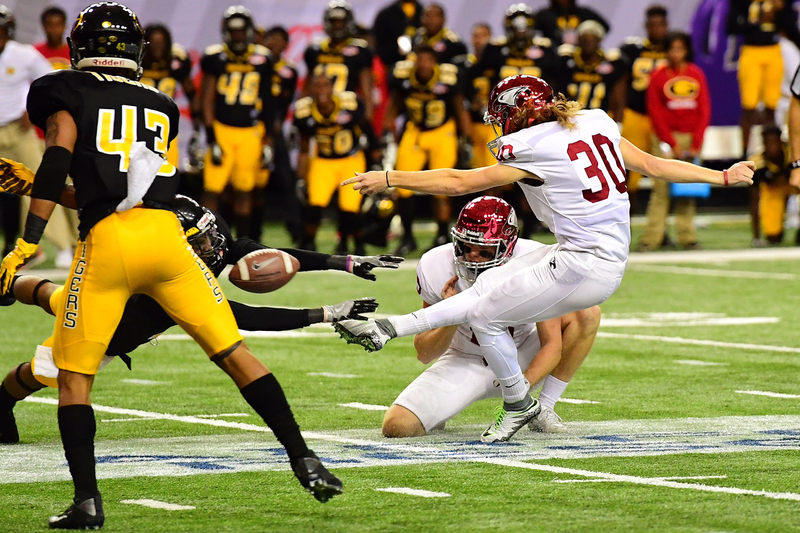 With the loss, NCCU’s nine-game winning streak was snapped, while Grambling finished the season on an 11-game winning streak and won its first national championship since 2008. Tigers running back Martez Carter provided the team with a major spark several times — scoring the team’s only touchdown of the game on a 32-yard sprint and adding a 30-yard punt return that put Grambling on the Eagles’ 11-yard line. Grambling State Tigers wide receiver Verlan Hunter (No. 2) catches a pass over North Carolina Central Eagles defensive back De’Mario Evans (No. 8) in the fourth quarter at the Georgia Dome. The Tigers won, 10-9. What looked like a first half defined by missed opportunities by both the Eagles and Tigers turned into a game riddled with squandered chances until the very end. No miscue was more detrimental than when the Eagles’ Quentin Atkinson hauled in a 39-yard touchdown from quarterback Malcolm Bell to bring the team within one of the Tigers, but was then assessed a 15-yard personal foul penalty for taking off his helmet. That call pushed the ensuing extra point attempt back, and Grambling’s special teams leaked through North Carolina Central’s line and blocked the PAT, maintaining the Tigers’ lead. After being held scoreless in the first half, Grambling State ripped of 10 unanswered points until the final 2 minutes, 14 seconds when Atkinson scored for NCCU. North Carolina Central Eagles kicker Brandon McLaren (No. 30) gets his kick blocked by a Grambling State Tigers defender. The Eagles’ second turnover of the game resulted in the deciding points of the game. Linebacker Arkez Cooper forced a fumble on the sack of Bell at the Eagles’ 22-yard line and Grambling recovered. The team would settle for a 26-yard field goal by Jonathan Wallace to put the Tigers ahead, 10-3, with 2:11 in the third quarter. North Carolina Central was held to its lowest point total since Oct. 8 against Florida A&M, when the Eagles only had a field goal. It wasn’t as if either team didn’t have ample opportunities: The Eagles 23-yard field goal came after Atkinson dropped a sure touchdown pass from Bell inside the Tigers’ 5-yard line. North Carolina Central’s first drive was a gift from Grambling quarterback DeVante Kincade, who killed the Tigers’ opening drive by throwing into coverage and the Eagles’ Alden McClellon intercepted the tipped pass in the end zone. A drive later, Grambling missed out on seven in a similar fashion after Chad Williams, the Tigers’ SWAC first-team receiver, bobbled and ultimately dropped a pass in the corner of the end zone. Grambling committed a delay of game penalty, setting them back five yards on a third down. They wouldn’t convert the next play, and the 30-yard field goal try on fourth down was tipped. On North Carolina Central’s ensuing drive following the missed field goal, Bell helped march the team down near the red zone with a 34-yard pass to LaVontis Smith on a third and 12. After going 10 plays and 68 yards, the Eagles’ drive stalled when Grambling’s Deaumante Johns intercepted Bell on the Tigers’ 8-yard line. 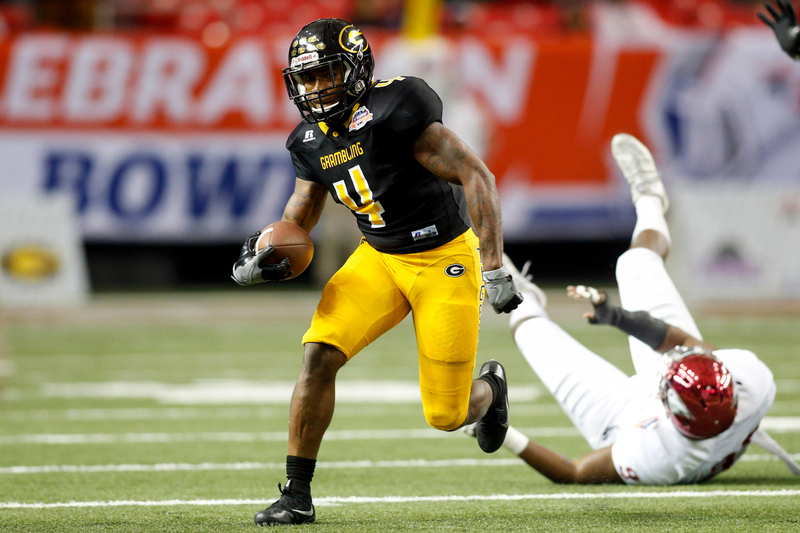 Grambling State Tigers running back Martez Carter (No. 4) runs the ball against the North Carolina Central Eagles in the second quarter at the Georgia Dome. Two drives later, the Eagles failed to do anything with outstanding field position after defensive lineman Frederick Henry-Ajudua, a first-teamer in the Mid-Eastern Athletic Conference (MEAC), came up with an 11-yard sack of Kincade on fourth and 14 from the NCCU’s 32. A 34-yard field goal try went wide left, and the score remained 3-0, Eagles, going into the half. In the fourth quarter, the Tigers had the ball on the Eagles’ 11-yard line after Carter’s 30-yard punt return, but Grambling was unable to get a fresh set of downs or punch the ball into the end zone on four tries. A second Bell interception halted another promising drive for the Eagles. The quarterback had moved the team to the Tigers’ side of the field at the start of the fourth quarter with a 46-yard pass to Smith along the left sideline. A few plays later, Grambling defensive back Jameel Jackson came up with the pick. “There were a lot of missed opportunities, ” Bell said. For players like Kincade, who transferred to the Tigers program from Ole Miss to be closer to his sick mother, this was an unexpected, but welcome close to a trying year. 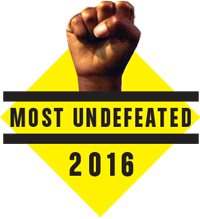 The other Tigers players who might not have foreseen such a grand accomplishment are ones who were freshmen and redshirt freshmen during the team’s tumultuous 2013 season, in which the players held a boycott that forced the team to forfeit one game. For them, this was an especially healing balm after they experienced a series of wounds inflicted by the carousel of coaches brought in to fix the program. But coach Broderick Fobbs made good on those promises and brought the team back to prominence. “Our kids were broken and they weren’t very trusting,” Fobbs said of the freshmen, who played under three different coaches in one year. “They didn’t say this, but the look on their face said, ‘How long are you going to be here?’ The feeling couldn’t get much worse … so there wasn’t much pressure. Grambling State Tigers defensive lineman DeVaughn Madise (No. 96) and offensive lineman Terry Boyd (No. 60) lift the trophy after a victory against the North Carolina Central Eagles in the Celebration Bowl at the Georgia Dome. Grambling State won, 10-9. “I think [legendary Grambling coach Eddie Robinson] would be happy with us. That we did it the right way. … I think he would be proud of us. … He may be a little disappointed in some of the hairstyles and not being clean-shaven, but I’m trying to bend some. The winning play came by way of special teams, but it was defense that dominated the Air Force Reserve Celebration Bowl. Both teams came into the game averaging more than 30 points per game this season (Grambling: 41.5, North Carolina Central: 30.7) and both were held to just one touchdown Saturday. Grambling stifles North Carolina Central run game: The Eagles came in averaging 170.8 rushing yards per game, third-best in the MEAC. The Eagles were held to 55 rushing yards Saturday, their lowest total since they gained 38 yards in their season-opening loss to Duke. North Carolina Central couldn’t handle Grambling’s blitz: North Carolina Central quarterback Bell completed seven of eight passes in the first quarter, but cooled off quickly. Why? Grambling started bringing the blitz and Bell struggled against it. The Tigers blitzed just twice in the opening quarter, but then sent five or more pass rushers on 69 percent of Bell’s dropbacks (18-of-26) from that point forward. Grambling turns to running game in second half: The Tigers were held scoreless in the first half for just the second time this season. The Tigers rallied for their only 10 points in the third quarter, largely thanks to their rushing game. 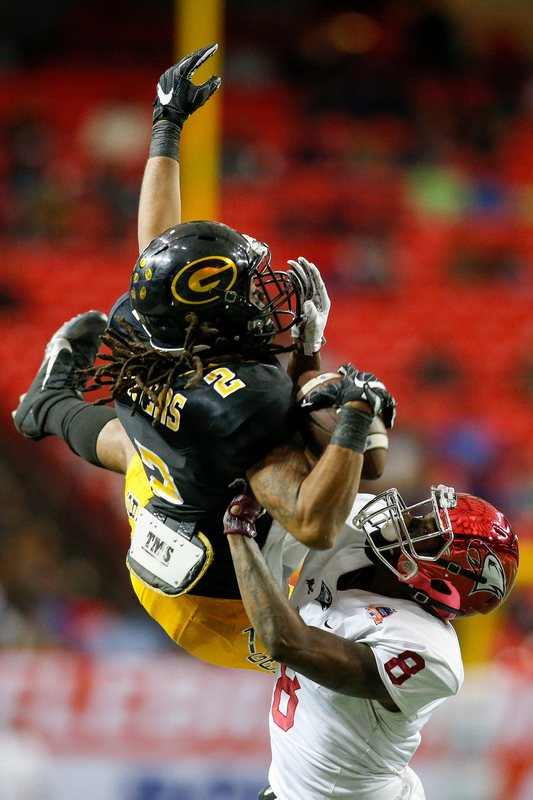 Grambling ran on 14 of its 18 plays in the third quarter, including a 32-yard touchdown by Carter. ESPN Stats & Information contributed to this story.